Traditional Naive Bayes Classiﬁer performs miserably on web-scale taxonomies. In this paper, we investigate the reasons behind such bad performance. We discover that the low performance are not completely caused by the intrinsic limitations of Naive Bayes, but mainly comes from two largely ignored problems: contradiction pair problem and discriminative evidence cancelation problem. 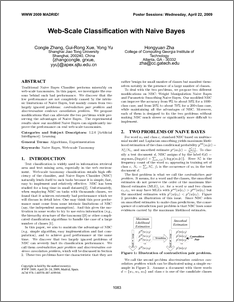 We propose modiﬁcations that can alleviate the two problems while preserving the advantages of Naive Bayes. The experimental results show our modiﬁed Naive Bayes can signiﬁcantly improve the performance on real web-scale taxonomies.